As we aim to help the Sphaeralogical community to classify and identify all of the various types of Super Balls® and there derivative spin-offs, it is important that we recognize the original Original Super Ball® that first appeared on the scene in 1965: Hypersphaera primogenitor. Here is the history of the Original Super Ball® as described on the fan site, Superballs.com. Yet no one who ever owned a Super Ball ® has forgotten the greatest bouncer of all time. No ball in history ever behaved like the Super Ball ® and none ever sold like it." Original balls are very hard to find these days. Most of them have either been lost or have detiorated and been thrown away. They do appear on-line occasionally, so you may be able to snacth one up and be able to appreciate their genius for yourself. 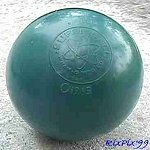 Superballs.com has links to sites that sell these balls as well as other helpful and fascinating information about the ball and its origins. We here at the I.S.S. hope to further enhance peoples' understanding of the history and science of these balls by adding depth to the information and ideas posted on this site and others like it and building a larger community around it. We thank the administrators of Superballs.com for there commitment to the study and promotion of the Super Ball® and hope that we are all successful in continuing to build interest from the community.